What would happen if you could relive a crucial part of your life again? A new Australian play available to amateur and other theatre groups. 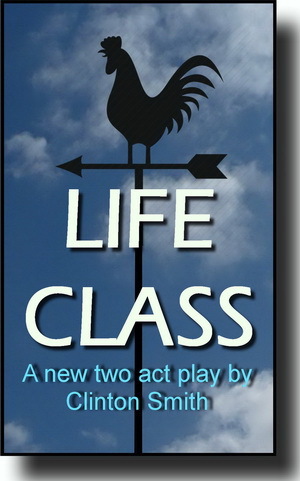 LIFE CLASS, is partly bathos, a window on a dysfunctional family, and includes a bravura part for an older woman. Nick, a smart-arse advertising man, is in a relationship with Sue, the semi-hysterical daughter of impractical retired anaesthetist Jim and his ex-journalist wife, the lewd, disruptive Aileen. The pair has another daughter, the vicious, dysfunctional Peggy. And, when Nick and Sue join the family for dinner, all hell breaks loose. But there is a second layer. Nick is concerned about himself, his damaging patter and superficiality. The play opens when he visits a mysterious Guide - a person able to examine his life and even change it. The Guide elects to show him the future - how events will unfold during the next days if he doesn't button his lip. Nick's loose talk lands himself and the family in an impossible situation. Sue announces she is pregnant by him. Peggy discovers and discloses that he has been unfaithful to Sue. The diabolical Aileen leaves Jim for another man. And Jim botches his suicide and ends up a veggie. At the height of this mayhem, the guide calls a halt. He tells Nick that these outcomes are inevitable unless he manages to be more economical with the truth. Nick agrees to be helped. His life unfolds again in fact - and, as we revisit crucial turning points in the previous scenes, he manages to restrain himself, aided by the Guide. Things still go pear-shaped. But the outcome is better -for Nick a least. Download a PDF of the complete play here.